A few weeks ago, Meghan posted about making tempeh tacos for dinner. I was immediately intrigued - I've mentioned before that tempeh is not my favorite vegetarian protein, and that I have only really enjoyed it in veggie burgers. For some reason, I prefer tempeh when it is crumbled rather than eating it in large pieces, so the idea of trying it in tacos appealed to me. I decided to create my own spin on this idea, adding some brown rice to the filling to give the texture more variety, and flavoring the filling with ingredients I usually use when making chili: onion, garlic, tomatoes, cumin, chile powder, smoked paprika, and cilantro. For toppings I used some red cabbage that was quickly marinated in lime juice and honey, which added both color and crunch, as well as creamy avocado and salty feta cheese. I really, really loved the result. These were wonderful vegetarian tacos that didn't use the typical combination of beans and loads of cheese. I think this might be my favorite tempeh preparation so far, and I'm definitely more open to playing around with more tempeh recipes now. I used bacon fat to cook the taco filling because I like the flavor, but this obviously makes the dish non-vegetarian. If you want it to be vegetarian or vegan, you can use butter or oil instead. Melt 1 tbs fat in a medium skillet over medium heat. Add onions and saute until they are soft and browned, about 7 min. Add remaining 1 tbs fat to skillet and heat until it is melted. Add tempeh and cook until tempeh is browned, about 10-12 min. Add garlic and saute for 30 seconds, or until fragrant. Add brown rice, tomatoes, vinegar, cumin, chili powder, and paprika and simmer mixture for 10 min, or until much of the liquid has evaporated. Remove from heat, stir in cilantro, and season to taste with salt. While tempeh cooks, combine lime juice, cabbage, and honey and mix well. Set cabbage aside to marinate until tempeh filling is ready. 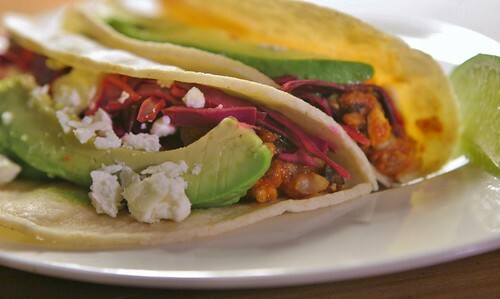 Serve tempeh with corn tortillas, cabbage, avocado slices, cheese, and lime wedges. Tempeh does have a special taste that is hard to get used to for many people.. I love all the spices in this, I'm still experimenting with tempeh recipes, I may have to give this one a try! This is just the recipe i need -- I tried tempeh for the first time a few weeks ago, sauteed in soy sauce and just didn't like the taste. I forced myself to eat a few servings and ended up throwing out the last bit because I hated it so much! Crumbed and jazzed up with Mexican flavors sounds much more appealing! Yeah, I first tried it in a stir fry and didn't enjoy it at all. I like it so much better crumbled because you get more of the sauce flavor in each bite. I've never cooked with tempeh but I'm kind of intrigued by it. It seems like these flavors would bring out the best in the tempeh! I really want to try cooking with tempeh- thanks for the inspiration! I have never cooked or heard about tempeh! These tacos look superb with all the spices and the bacon in them!